We report for the first time the direct measurement of spin polarization in epitaxial CoFe2O4 tunnel barriers using the Meservey-Tedrow technique. We further analyze the effect of oxidation conditions during film growth on the polarization of the tunneling current (PSF), revealing an important role played by oxygen vacancies in the spin-filter efficiency of this material. These spin filtering measurements have been performed in collaboration with the team of J. S. Moodera from the Francis Bitter Magnet Lab, MIT. 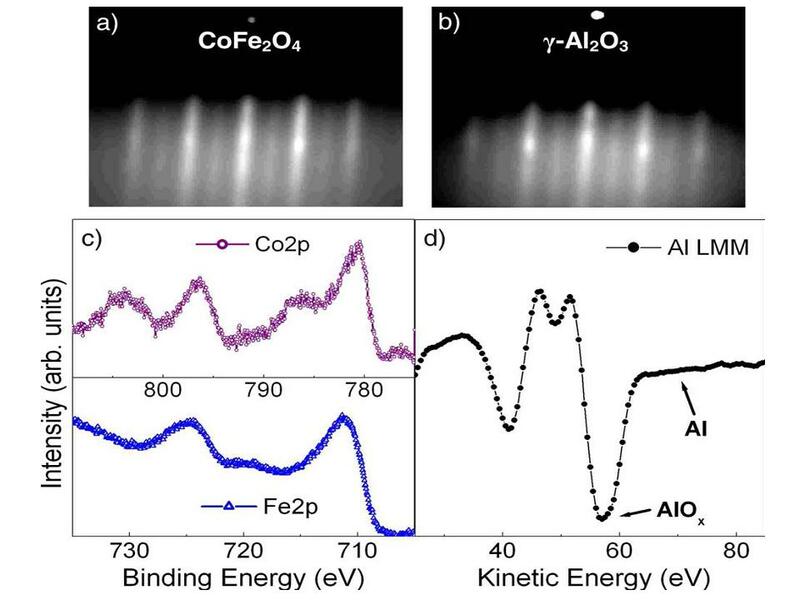 In situ structural and chemical analysis of a CoFe2O4(111)(3nm)/g-Al2O3(111)(1.5nm) tunnel barrier including the reflection high-energy electron-diffraction patterns, the Co2p and Fe2p x-ray photoelectron spectroscopy peaks and the Al LMM transition in the Auger electron spectroscopy spectrum of the g-Al2O3 layer. CoFe2O4(111)/γ-Al2O3(111) epitaxial double tunnel barriers were grown in ultrahigh vacuum by molecular-beam epitaxy using a radiofrequency oxygen plasma as the source of atomic oxygen. The films were deposited on α-Al2O3(0001) substrates covered with a buffer layer of Pt(111) using Knudsen cells for Co, Fe, and Al, and reactively evaporated. Samples were fabricated using different oxygen partial pressures in the plasma source (PO2), ranging from PO2 =0.2 to 0.4 Torr during growth. These corresponded to an oxygen pressure inside the evaporation chamber of 1.9 10-8 to 1.0 10-7 Torr. We chose to perform spin-polarized transport (SPT) measurements on CoFe2O4(111) capped with γ-Al2O3(111) in order to reproduce the exact tunnel barrier as in our CoFe2O4-based MTJs. Also, the γ-Al2O3 layer served to protect CoFe2O4 from exposure to air when samples were transported from the MBE chamber to the thermal evaporation chamber used to deposit Al electrodes. Spin-polarized tunneling in two Pt(20nm)/CoFe2O4(4nm)/g-Al2O3(1.5 nm)/Al(4.2nm) tunnel junctions grown in different oxidation conditions and measured at 0.45K. a) A 0.24 Torr sample measured at H=3.3T and H=3.7T (inset). b) A higher-oxidized sample (0.26 Torr) measured at H=3.7T and H=4.3T (inset). SPT measurements were carried out next for the Pt(20nm)/CoFe2O4(3nm)/g-Al2O3(1.5nm)/Al(4.2nm) tunnel junctions in a 3He cryostat at 0.45 K.
All samples with PO2 ranging from 0.2 to 0.4 Torr were measured, but a variation in the SPT characteristics was observed only for samples grown between 0.2 and 0.26 Torr. We will therefore concentrate on the results from three sample sets with PO2 =0.2, 0.24, and 0.26 Torr. The dynamic tunneling conductance (dI/dV ) versus bias voltage (V) curves measured in all junctions at zero field showed zero conductance at V=0 and sharp symmetric peaks on either side of V=0. These properties confirm the high quality of the tunnel junctions. Upon application of a magnetic field, there was Zeeman splitting of the Al quasiparticle density of states. The Zeeman-split dI/dV curves were visibly asymmetric, indicating that the tunneling current is indeed spin polarized. In the 0.2 Torr sample (not shown here), the asymmetry of the conductance peaks measured at 2.9 T corresponded to PSF= 6%. For the 0.24 Torr barrier, the asymmetry of the conductance peaks at H=3.3 and 3.7 T corresponds to PSF=12%, shown in Fig. a). The increased value of PSF in the 0.24 Torr sample with respect to that for 0.2 Torr shows that the stronger oxidation conditions have a positive effect on the spin-filter efficiency of the CoFe2O4 barrier. 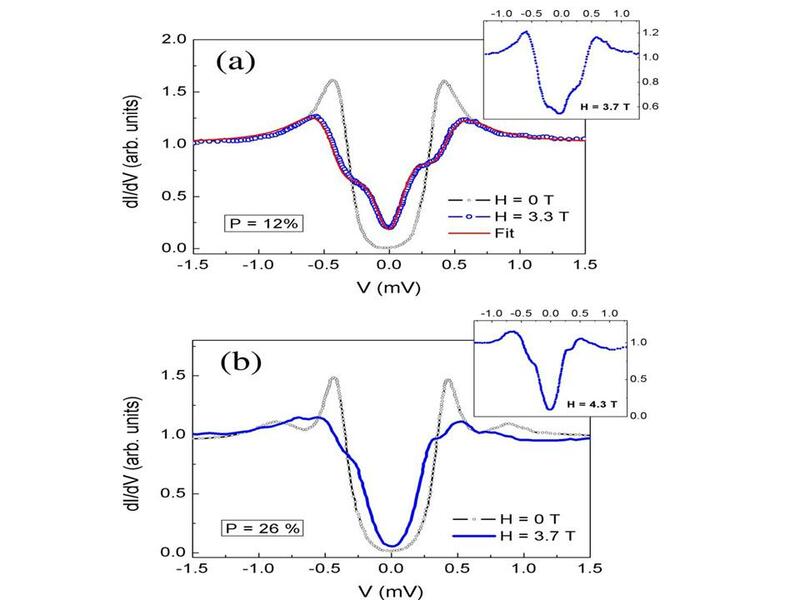 This trend is further confirmed by the SPT measurement of the 0.26 Torr sample, which for an applied magnetic field of H =3.7 T yields PSF=26% Fig. b). These SPT results reveal that in the presence of oxygen vacancies, defect states in the CoFe2O4 band gap lower the effective tunnel barrier height, create spin-scattering centers, and are less exchange split, resulting in a reduction in the spin-filter efficiency. This work at MIT was supported by NSF and ONR grants as well as by a MIT-France program. A. V. Ramos, T. S. Santos, G. X. Miao, M.-J. Guittet, J.-B. Moussy, and J. S. Moodera, Phys. Rev. B 78, 180402 (R) 2008. A. V. Ramos, "Epitaxial Cobalt-Ferrite Thin Films for Room Temperature Spin Filtering", Ph. D. thesis (2008).